According to HMRC, 80 per cent of ISA accounts subscribed to in 2015/16 were in cash, with £58.7bn saved. Can the growth of impact investing produce a new generation of investors? The humble cash ISA has long reigned supreme. And while keeping an emergency fund or saving for a down payment on a house in cash make sense, an over-abundance of cash in the current climate could actually lose you money. As at July 2016, the Retail Price Index was running at 1.9%, whereas the average Cash ISA now pays 0.99%. At these rates £100,000 would be worth £91,420 after ten years as inflation eats away at your savings. Furthermore, the Bank of England’s decision to cut interest rates to an all-time low of 0.25% last month is likely to see saving rates fall further, meaning even lower returns. The longer term prospects of the stock market are simply far more attractive than below inflation interest rate returns. But many people struggle to understand their investment options and worry about what they are actually investing in. One option is to embrace different motivations and invest in what you believe in. In recent years, more and more people are looking for their money to ‘do good while doing well’. The emergence of impact investing – financial investments that produce significant social or environmental benefits, alongside an attractive financial return provides an opportunity for people to become reconnected. Not just to their money, but also to the social and environmental impacts that this has. So far this has taken many forms for retail investors; charity bonds, crowdfunding for community based-initiatives and specialist funds from the likes of Impax Asset Management. One previous criticism of investing ethically is that returns had to be sacrificed. However, this assumption is increasingly being challenged. Indeed, a recent benchmark study from Cambridge Associates shows the opposite to be true. The positive impact approach leads to selecting companies that are bringing solutions to real social and environmental problems to market, and actively trying to run their businesses in a sustainable manner. Such companies tend to avoid fines and other penalties, and have stronger relationships with their customers, suppliers and staff. They also tend to operate in emerging sectors with high-growth potential. 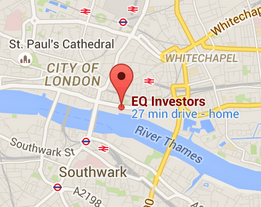 Of course, identifying these companies is time consuming and that’s where EQ can help. We provide ‘positive impact’ portfolios on a discretionary basis. This means our expert team does all the researches and monitors the investments so you don’t have to. This blog is an extract taken from a new publication, ‘The Good Guide to Finances at 40’. Download a copy here.